I have to say, I expected this show to be funny but I didn’t expect it to have as many laughs as it did. Some of the laughs where OMG that’s funny, some of the laughs where OMG I can’t believe they just did that. Definitely not a show for the whole family! So ya, I loved it. I was also pretty impressed that they did all of the necessary scenes – the bad, bad, evil trees scene (they lowered everyone’s karma in the room by making us laugh so much at this), the chainsaw scene, all the good stuff. My favorite part? The fact that they embraced campy in every way possible. If you are in Tampa and free this Saturday or Sunday night you should absolutely go see it – You can get your tickets on Straz Center’s website. Unfortunately I wasn’t able to get any pictures, so you’ll just have to take my word for it. Evil Dead the Musical is playing in more places than Tampa (I know, what? why?) 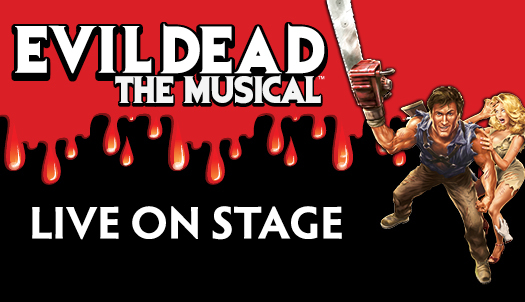 – you can follow Evil Dead The Tour on Twitter to see if they are coming to your town. If you go come back and tell me what you thought! I received two tickets to Evil Dead the Musical in exchange for writing a review. As always, my opinions are all mine. This entry was posted in Review, Sci Fi, Zombies and tagged #LoveFL, #NaBloPoMo, #photo101, Tampa by Kinda Zennish. Bookmark the permalink.